The system is self-load sensing but the differential will rise if the flow exceeds that calculated for each orifice. In last week's post, referencing circuit ‘A’, without EP1, the sensing differential will simply rise to 25 bar / 362 psi at full speed of 2500 rpm and the full flow of 125 lpm / 33 gpm will still be shared. Small errors in orifice size or calculation will simply raise or lower the max pressure slightly. This allows the max/min orifice pressure drop to be optimized by clipping off the maximum flow. In the previously mentioned circuit ‘A’ the total flow is limited to 100 lpm / 26 gpm and the max pressure is limited to 16 bar / 230 psi above the max load. You can see that the more flow you are prepared to lose (dump to tank) at a higher speed the better the control at lower speed (if, for example, the application needed good division at 500 rpm). OK, so we can’t use this system to make a flow divider / combiner cartridge valve but we can often achieve the same performance with the 4 way circuit below (Circuit B). A spool-type flow divider could be used in this circuit but perhaps without the versatility. Pump load sensing may be desirable In this case. 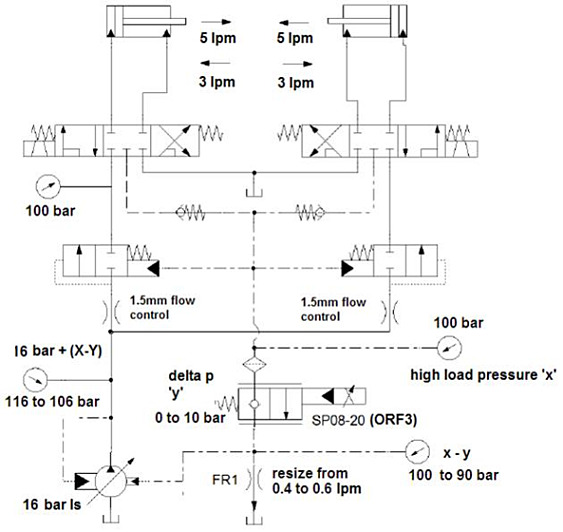 In circuit B, a small flow control valve or orifice is added to the load sense line. The maximum actuator speed can be adjusted to achieve the same or different max speed in either direction. This can be useful for limiting control for inexperienced operators. 10 lpm / 2.5 gpm pump output split 50/50 to provide 5 lpm / 1.25 gpm max to each actuator for extension and 3 lpm / 0.8 gpm max to each actuator for retraction. 1.5 mm orifices will allow the 5 lpm / 1.25 gpm individual flows at 16 bar 232 psi pressure drop. The same orifice size needs only 6 bar / 87 psi drop to achieve 3 lpm for retraction. This is achieved by setting the SP Proportional Valve (or switched ORF 3) to provide 10 bar / 232 psi drop in the LS line (16 - 6 bar / 232 to 87 psi) after the EP signal. Note that FR1 is compensated and maintains LS flow at 0.4 lpm / .1 gpm such that ORF3 drop is consistent, irrespective of LS line pressure. The actual size of ORF 3 is then about 0.5 mm. Increase the flow of FR if this is considered too small. 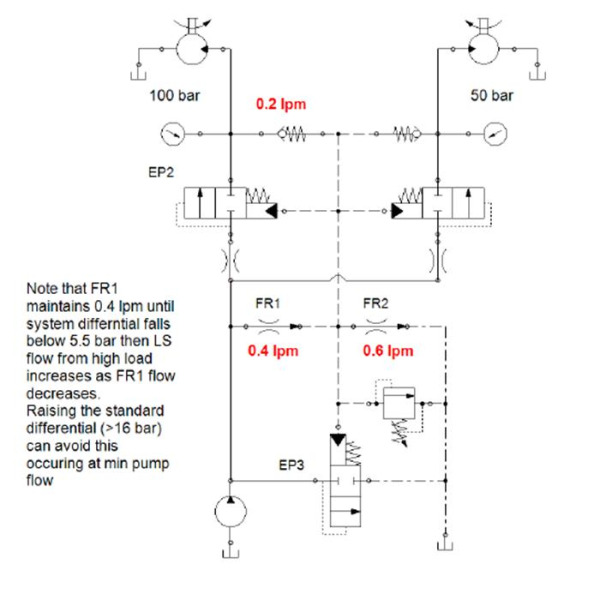 Total pump flow can be supplied to either of the single actuators by increasing the control orifices to approx 2mm and adjusting the SP values to suit. A spool divider/combiner can meter in and out, possibly with service line flow controls. Circuit B is purely meter in but flow can be controlled using small valves in the sense line. Any number of cylinders can be used. There is increased flow potential if only one function is required. The second leg flow does not have to be diverted back in to the system (as with a spool divider). Cylinder ratios must be the same if fixed flow control is used but relative cylinder size is unimportant. The normal Q max compensation value should be high enough so that the pressure drop at Q min is not swamped by other variances (manifold losses/ spring tolerance/sense line drop, etc). This is not normally a problem where full flow is taken over an engine speed range. However, if full control is required over a larger flow range, then a higher differential needs to be generated (pressure differential varies by 16:1 for a 4:1 flow variance). A major benefit of these systems is that they do not suffer from the high pressure drop stresses that are imposed in a spool divider, so full system pressure drop can be tolerated. Accuracy will be good if the pump is not load sensed and bleed down is not required for dynamic response. If bleed down is required, then the highest load will always lose flow via this path. See circuit C below for an example of a high flow dividing circuit. This is a fairly typical example of a high flow systems, and can be applied when the highest load always appears at the same leg. Bear in mind that the bleed flow can be quite high where a variable load sensing pump employs a non compensated orifice. An external bleed using an FR Flow Regulator valve can limit this value to about 0.5 lpm. Reduction to about 0.2 lpm is possible as shown below. Consider system response when doing this, particularly with variable pumps, as you may lose some reponsiveness. This can easily be overcome by introducing a load sense relief (set to 10 bar / 145 psi below p max) together with an additional orifice. Fine control needle valves (NV08-21) can be used for trimming out inaccuracies. These can be used in parallel or in place of the control orifices. Note that trimming maintains the percentage split over the flow range whereas trimming a spool divider does not. Simultaneous flow control of all legs can be achieved by installing a small variable orifice in the load sense line to provide a fully variable divider (NV08-21 or SP08 as in circuit B). This can easily be made by changing orifices, using SP proportional control valves or simply switching in a different size orifice.